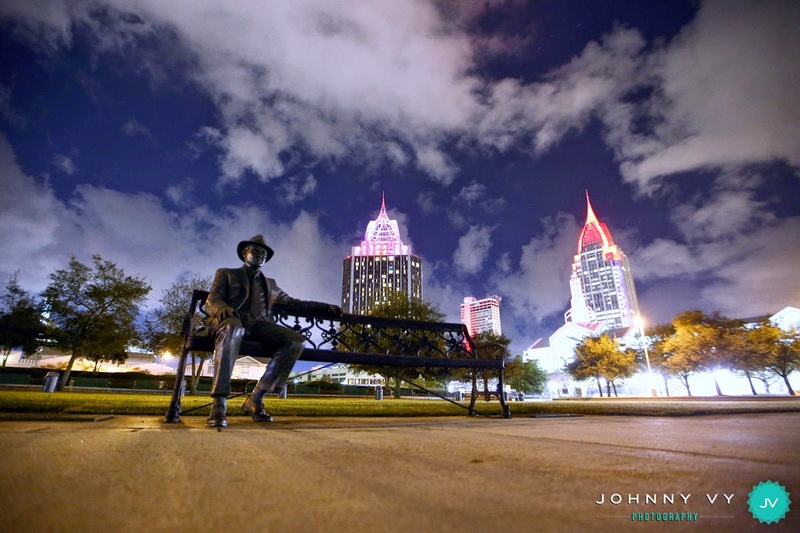 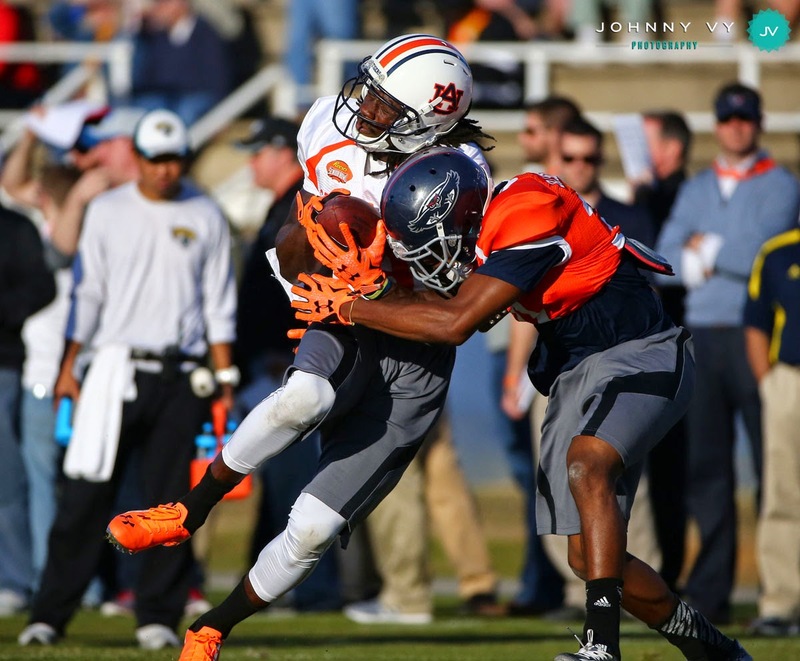 Auburn tight end C.J. 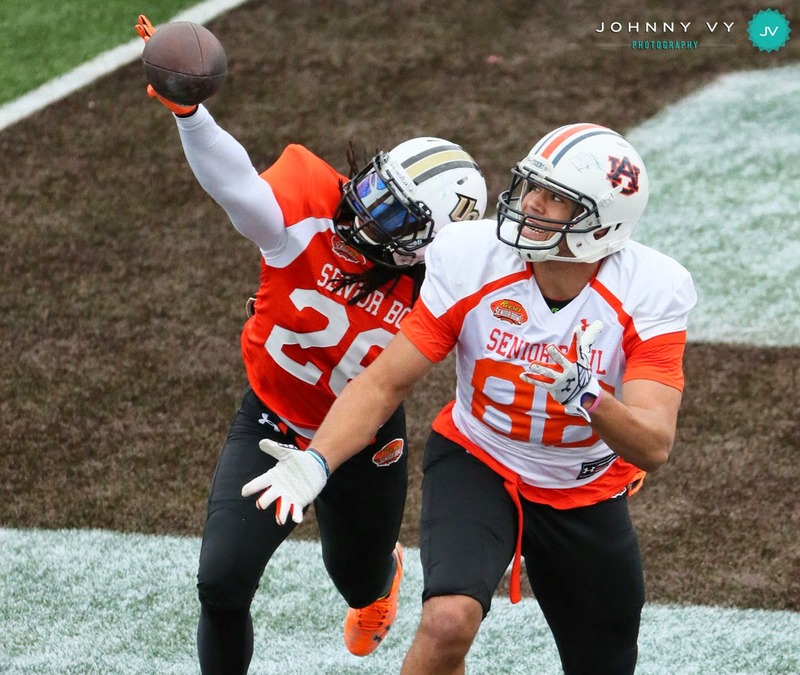 Uzomah (88) and Central Florida safety Clayton Geathers (26) reach for a pass during the South team practice. 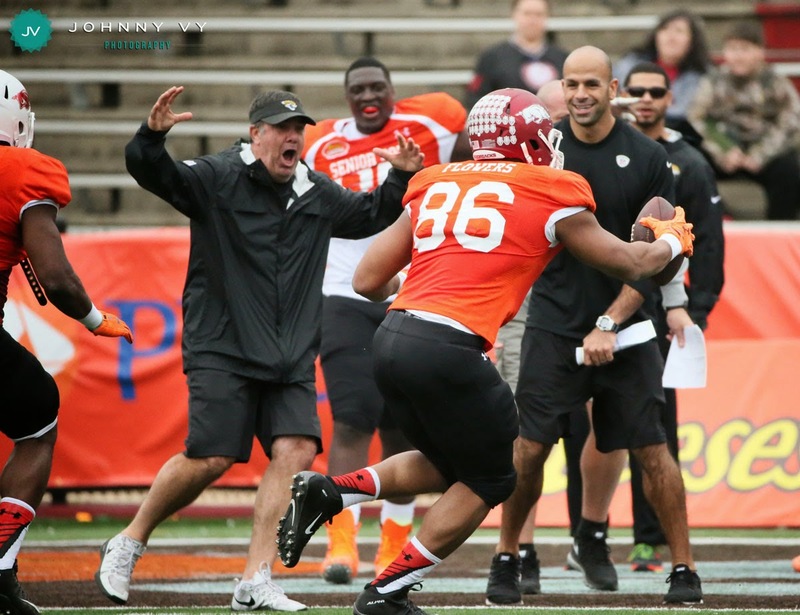 Arkansas defensive end Trey Flowers (86) runs into the end zone after recovering a fumble, while coaches and teammates react. 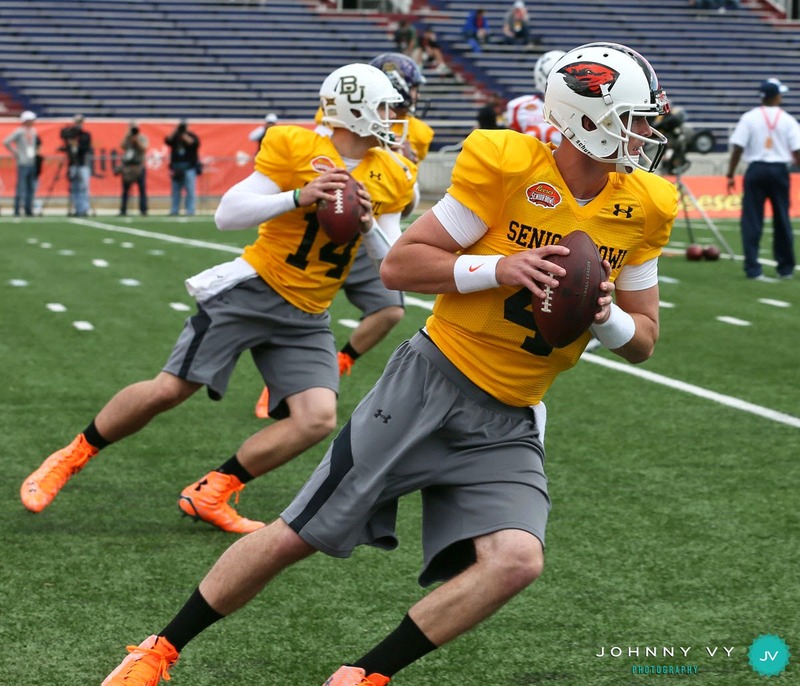 Oregon State quarterback Sean Mannion (4) and Baylor quarterback Bryce Petty (14) of the North team during the North team practice. 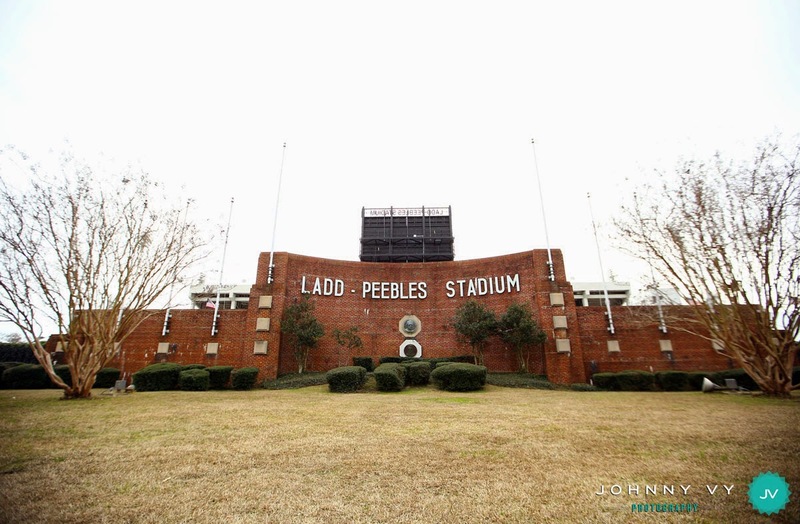 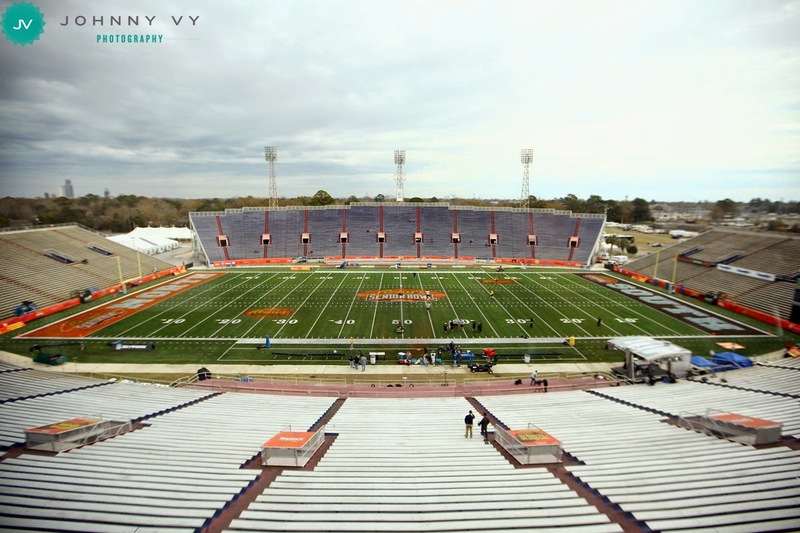 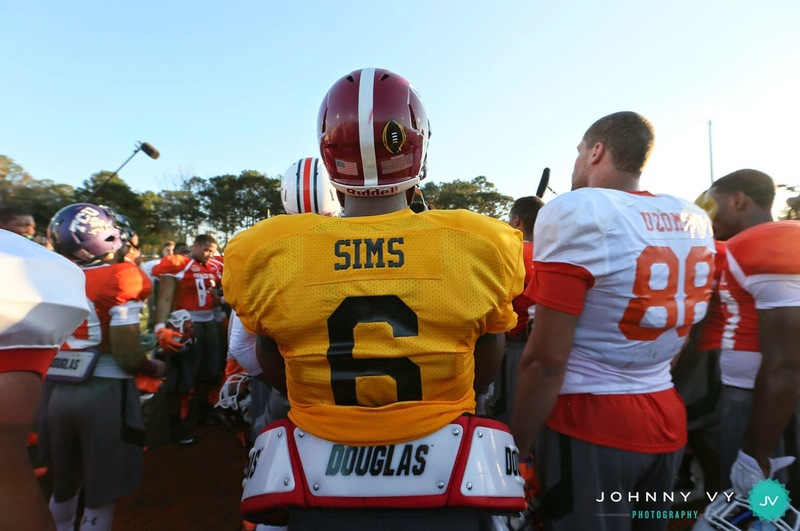 Alabama quarterback Blake Sims (6) looks on during the South team practice for the 2015 Senior Bowl at Fairhope Municipal Stadium in Fairhope, AL. 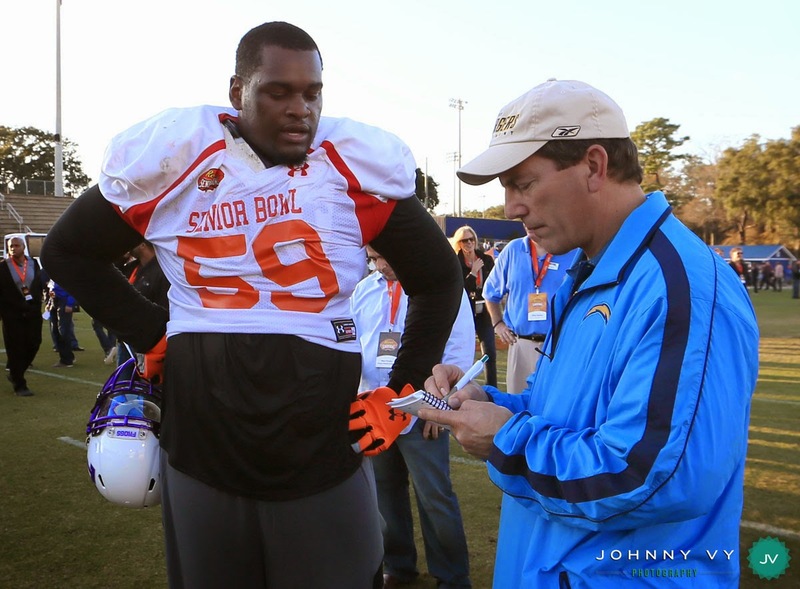 TCU offensive tackle Tayo Fabuluje (59) is interviewed by a San Diego Chargers scout following the South team practice. 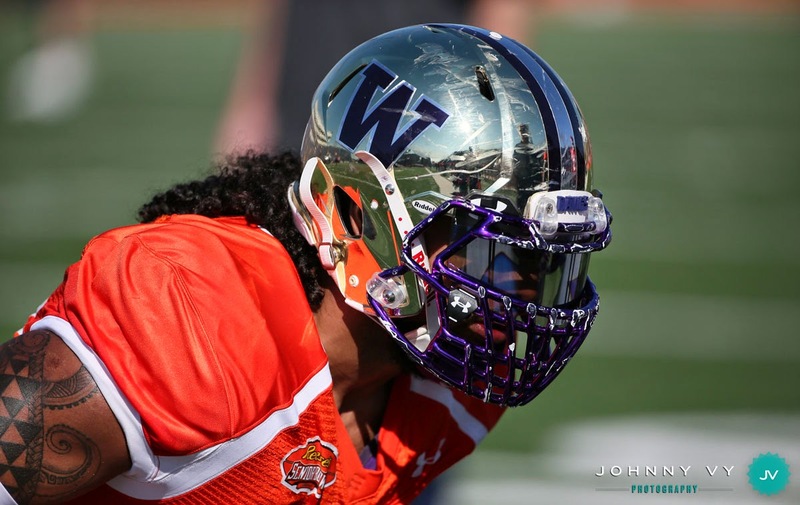 Washington defensive end Hau'oli Kikaha (98) is seen in action. 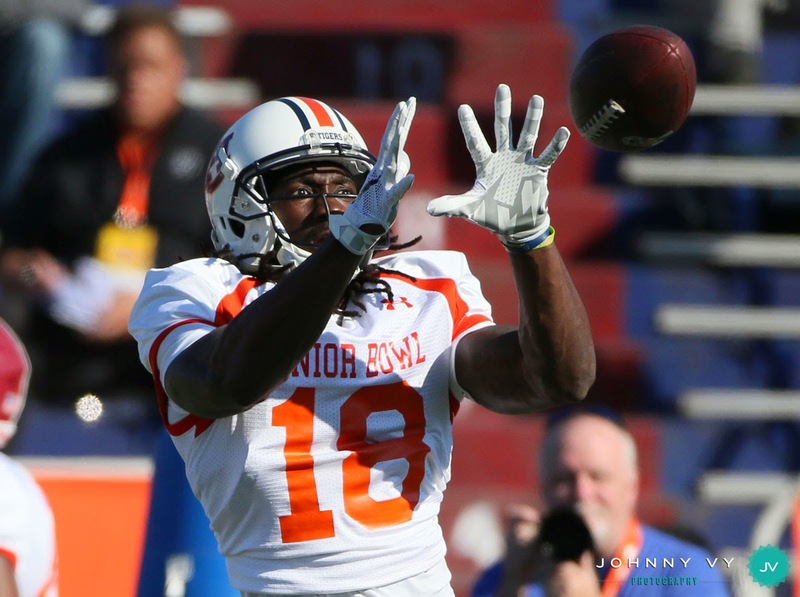 Auburn wide receiver Sammie Coates (18) makes a catch during the South team practice. 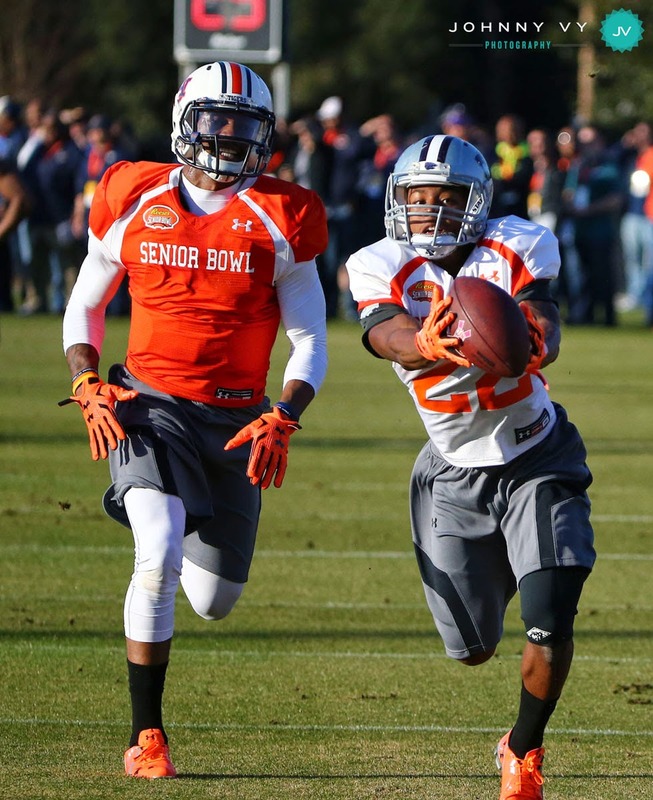 Central Florida wide receiver Rannell Hall (2) makes a catch against TCU cornerback Kevin White (20) during the South team practice. 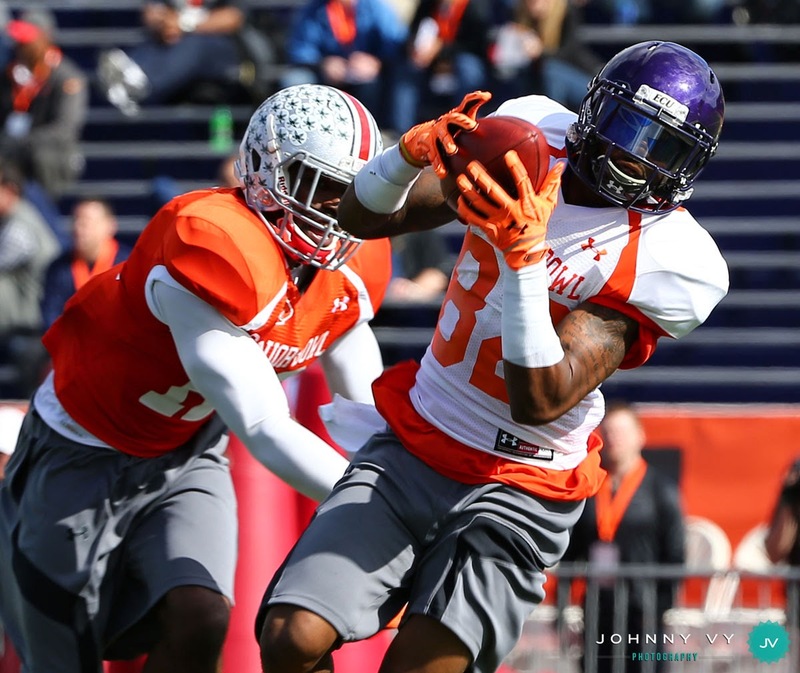 Central Arkansas wide receiver Dezmin Lewis (15) reaches for a pass against Northwestern State cornerback Imoan Claiborne (28) during the South team practice. 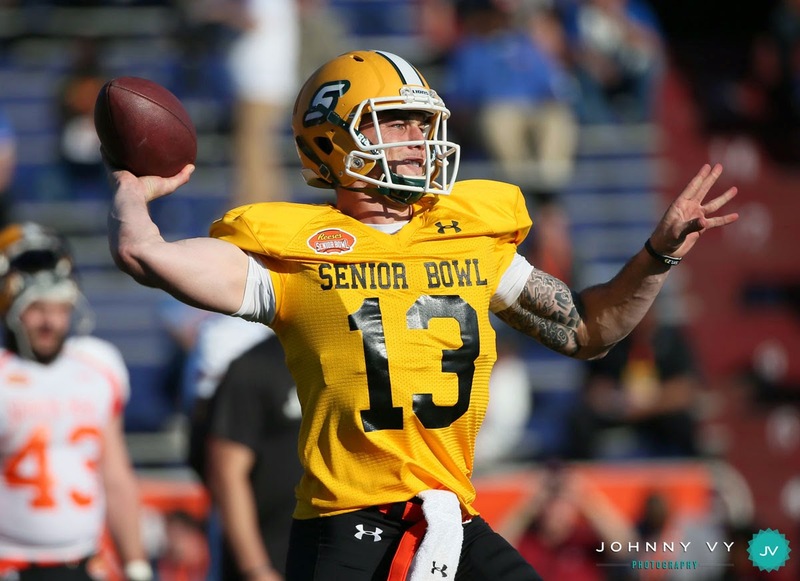 Southeast Louisiana quarterback Bryan Bennett (13) drops back to pass. 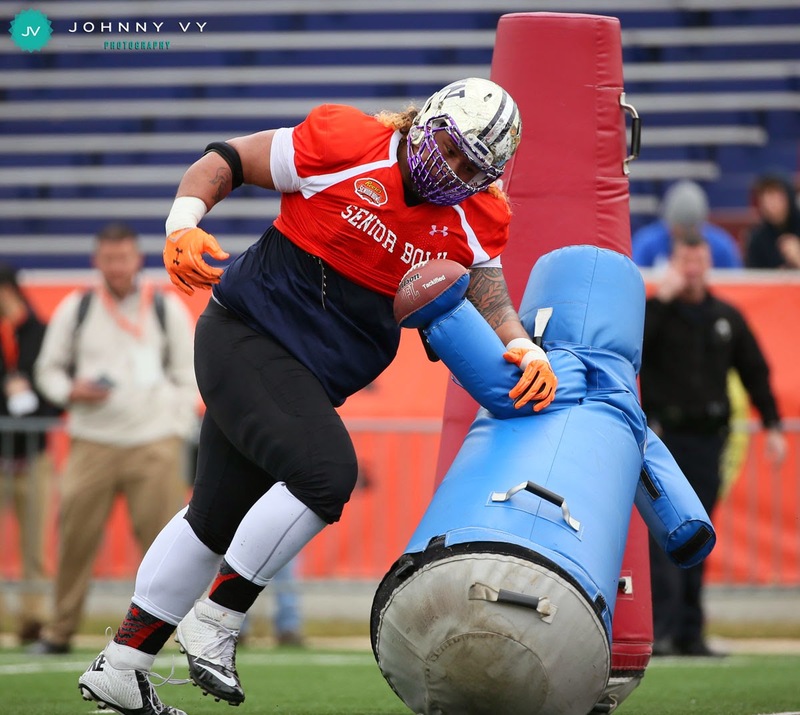 Washington defensive tackle Danny Shelton (95) destroys stuff. 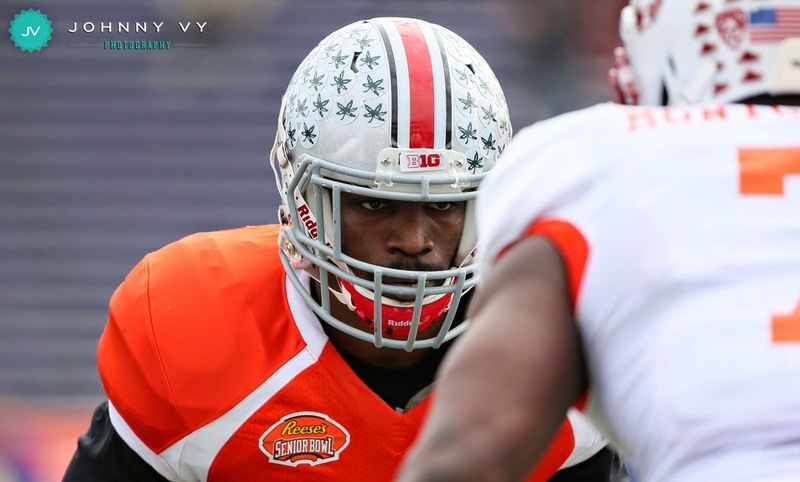 Ohio State safety Doran Grant (12) in position during the North team practice. 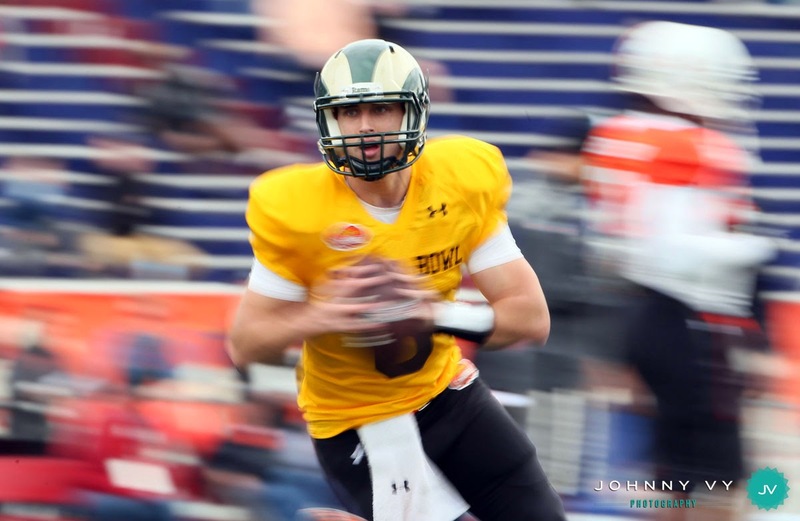 Colorado State quarterback Garrett Grayson (8) rolls out to pass during the South team practice. 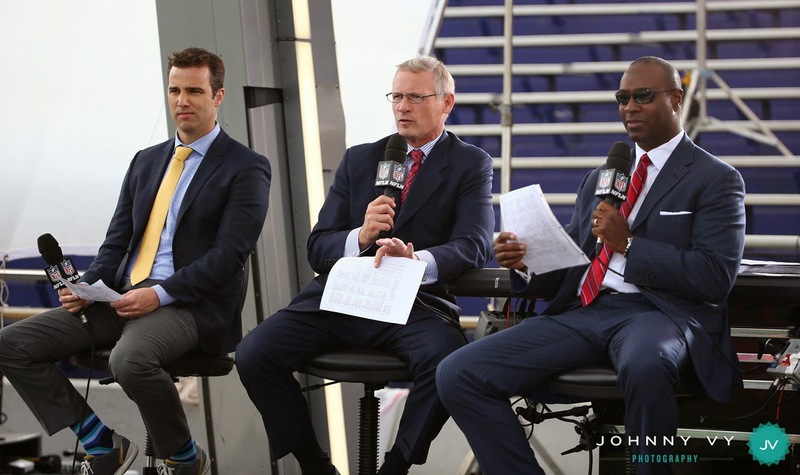 NFL Network talent Daniel Jeremiah, Mike Mayock, and Charles Davis are seen on the set during the North team practice. 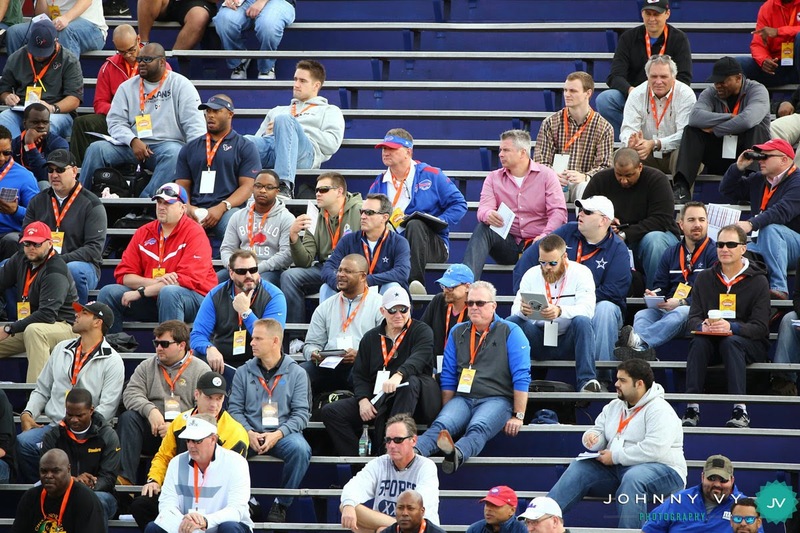 NFL scouts are seen in the bleachers during the North team practice. 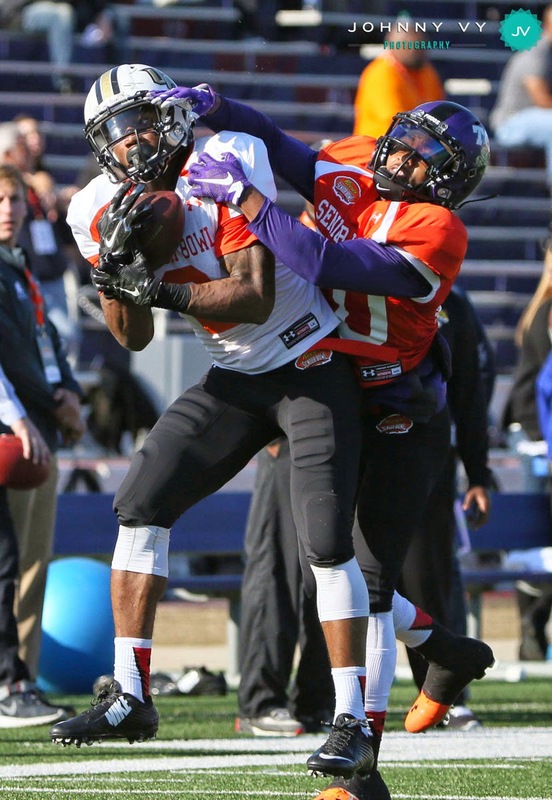 East Carolina wide receiver Justin Hardy (82) of the North team makes a catch. 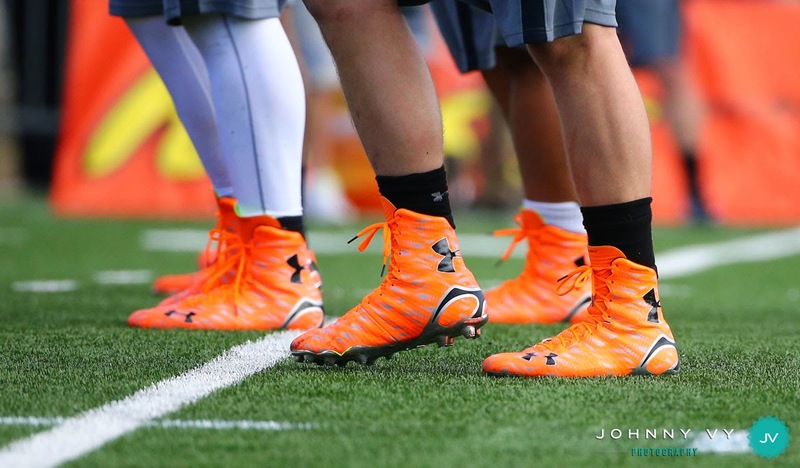 Neon orange Under Armour shoes are worn during the North team practice. 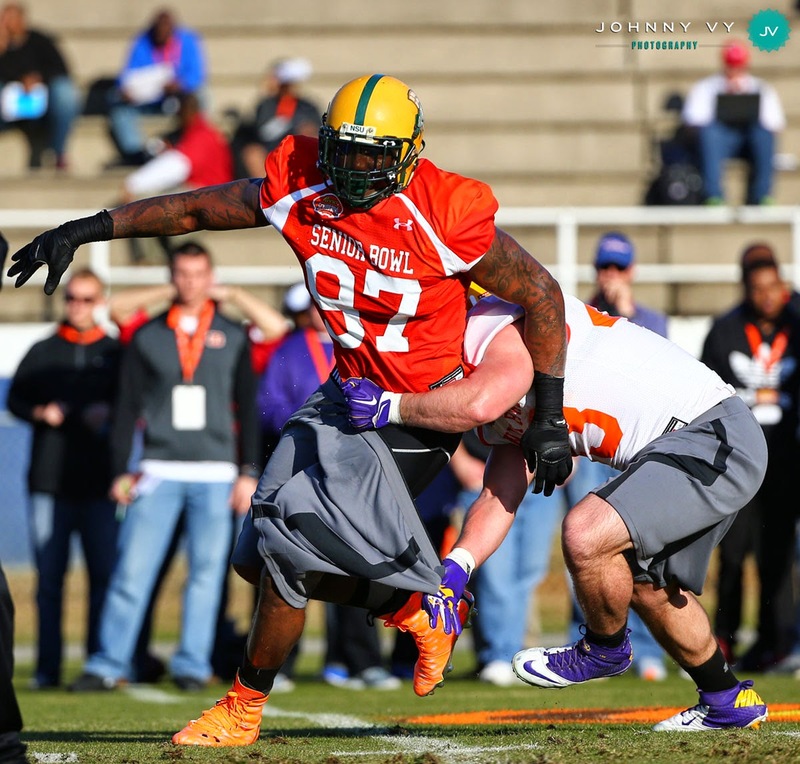 Norfolk State outside linebacker Lynden Trail (97) loses his shorts. 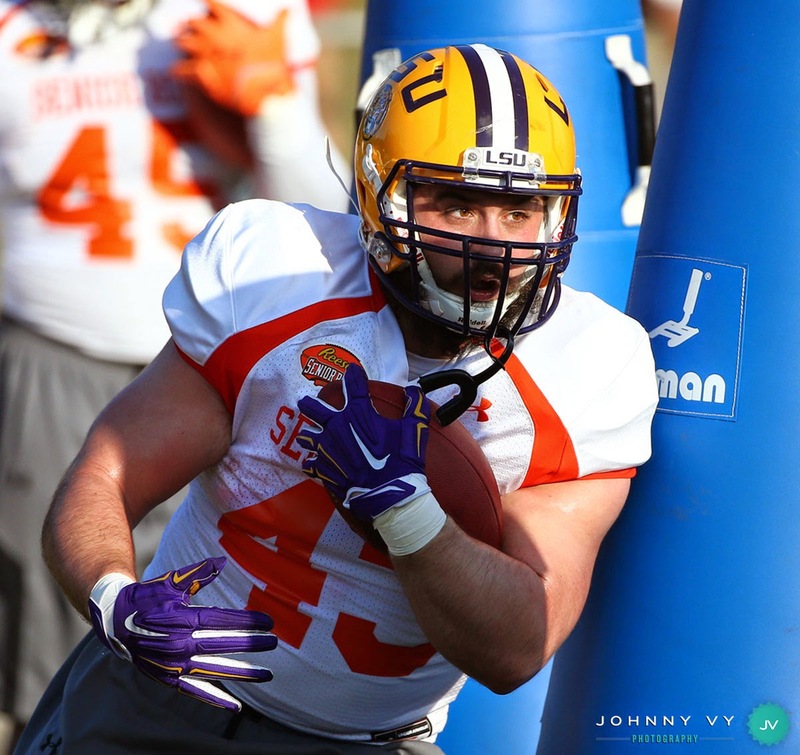 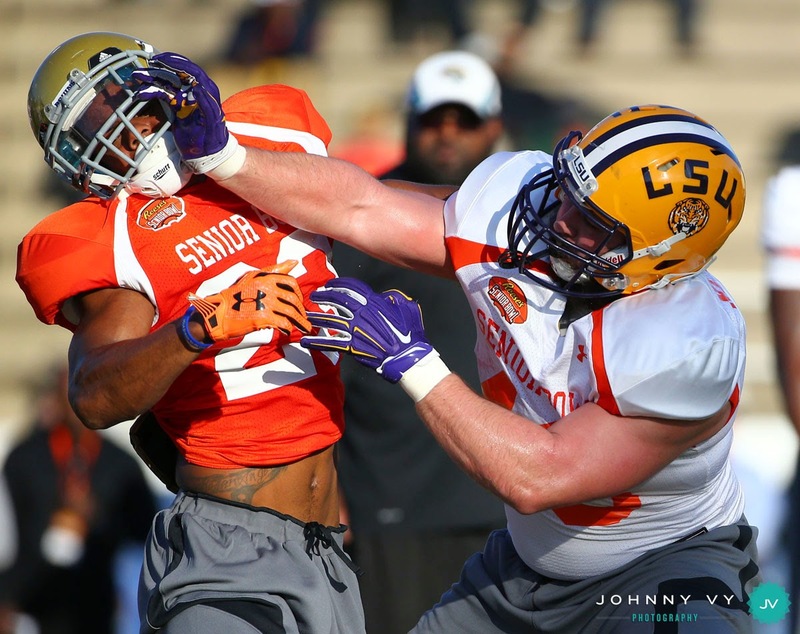 UCLA safety Anthony Jefferson (23) and LSU fullback Connor Neighbors (43) in action. 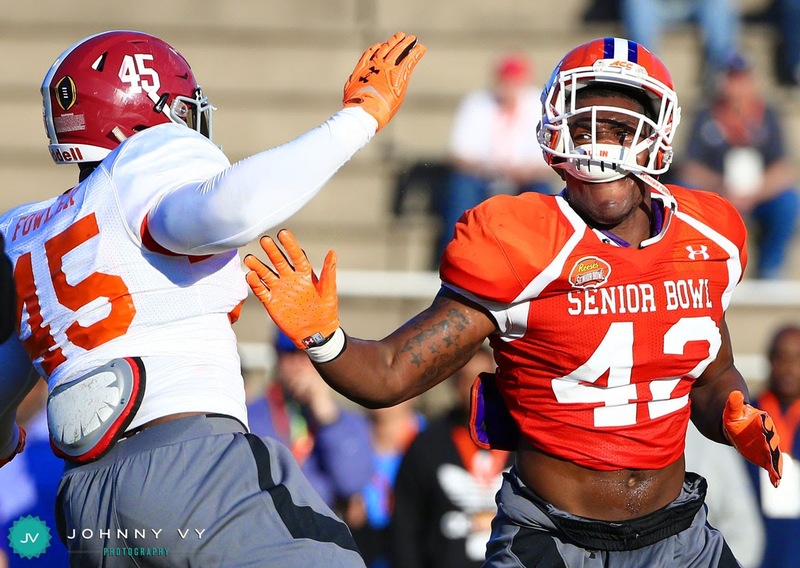 Clemson inside linebacker Stephone Anthony (42) has his helmet pushed up by Alabama fullback Jalston Fowler (45) during the South team practice. 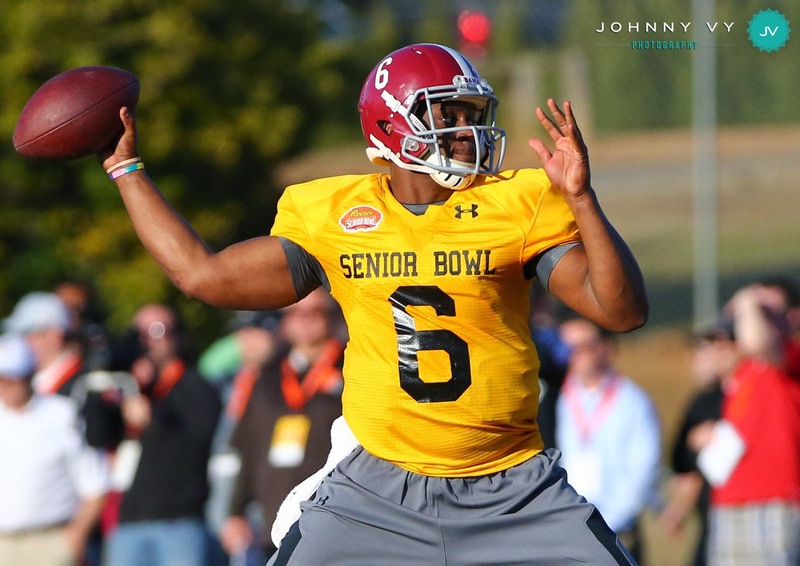 Alabama quarterback Blake Sims (6) drops back to pass during the South team practice. 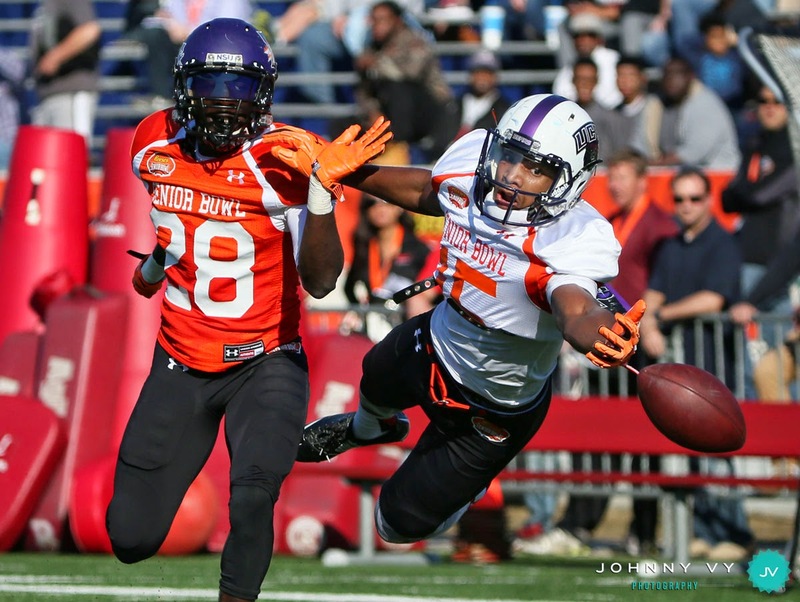 Kansas State wide receiver Tyler Lockett (22) hauls in a pass during the South team practice. 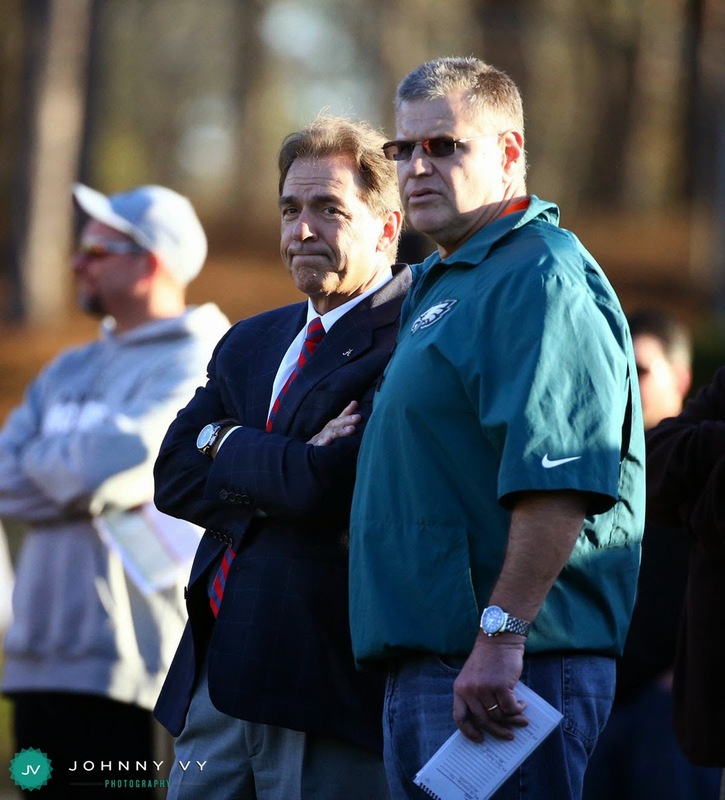 University of Alabama head football coach Nick Saban looks on during the South team practice. 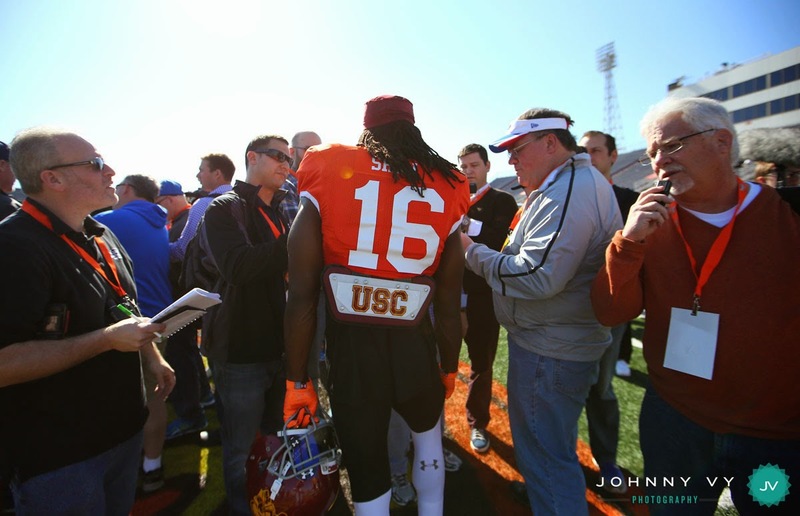 USC defensive back Josh Shaw (16) answers questions from the media following the North team practice. 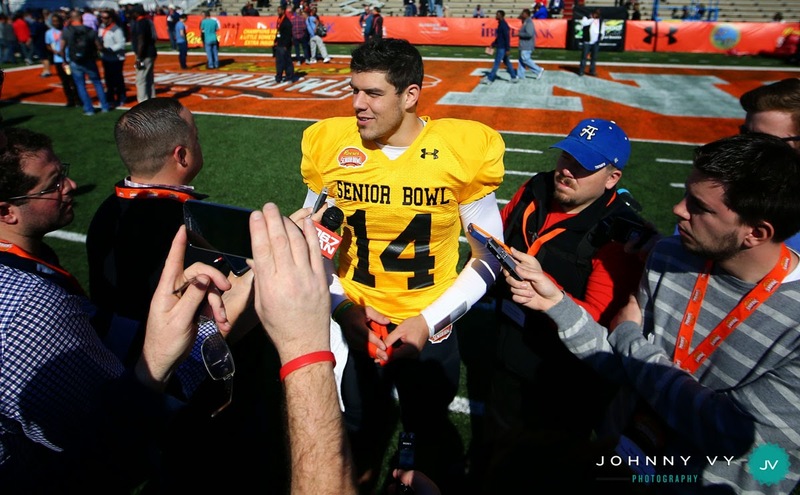 Baylor quarterback Bryce Petty (14) answers questions following the North team practice. 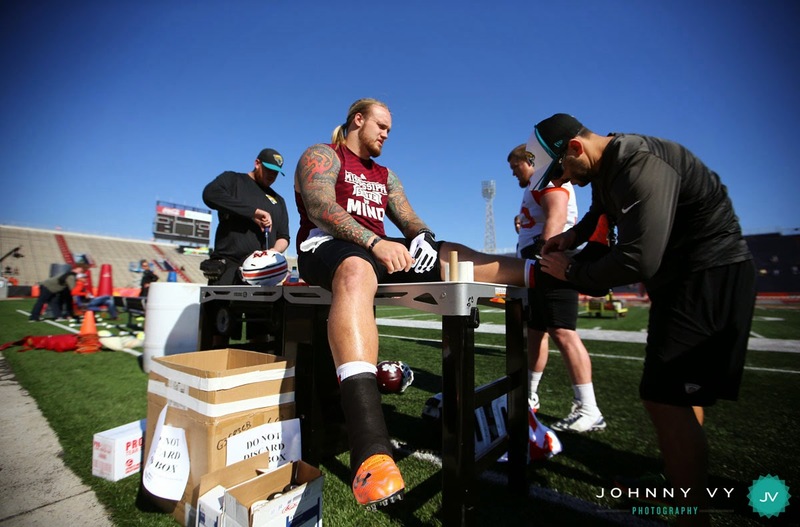 Mississippi State offensive lineman Dillon Day (63) has his ankles taped before the South team practice. 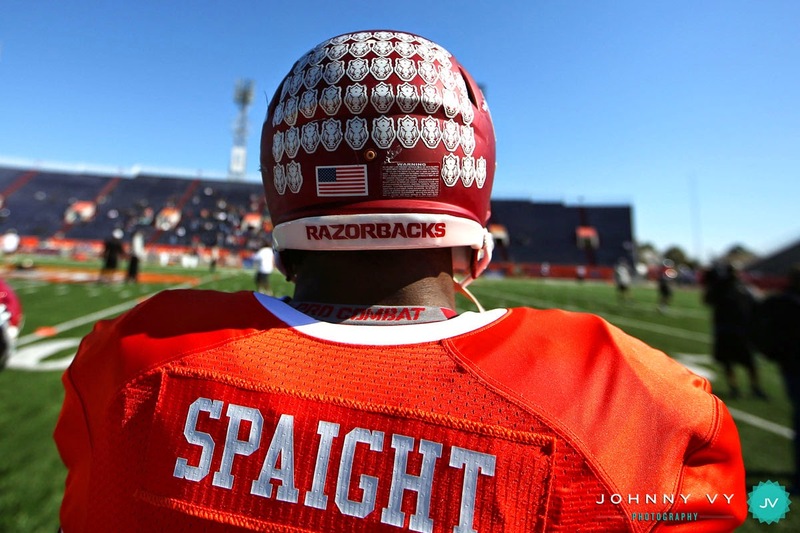 Arkansas outside linebacker Martrell Spaight (47) looks on during the South team practice. 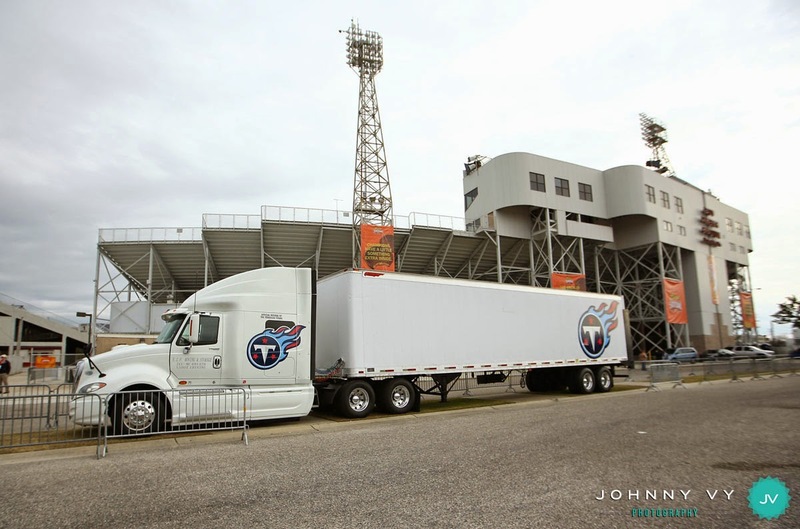 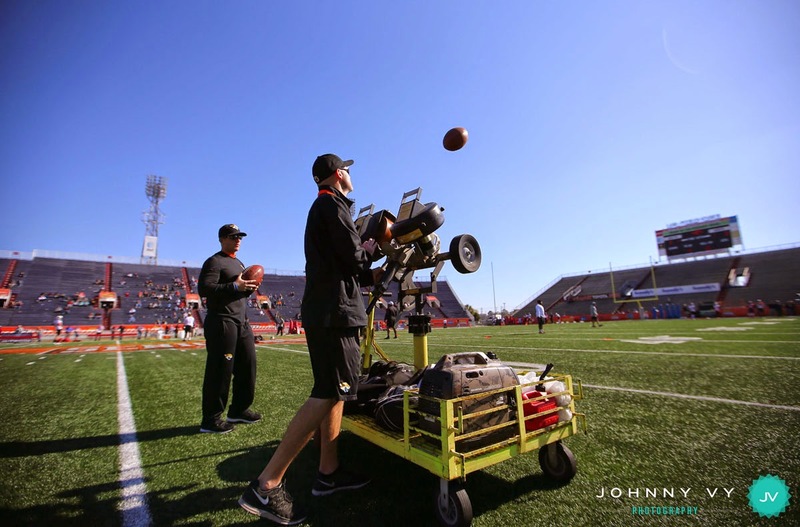 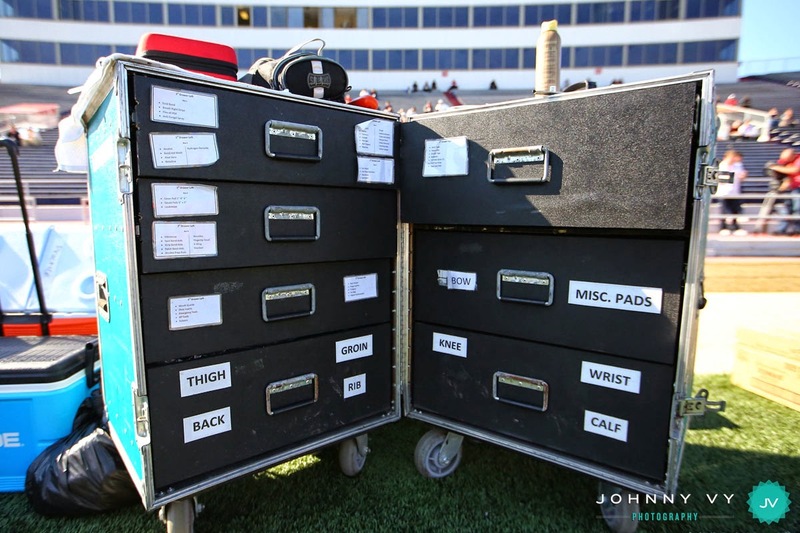 The Jacksonville Jaguars equipment cart is seen during the South team practice. 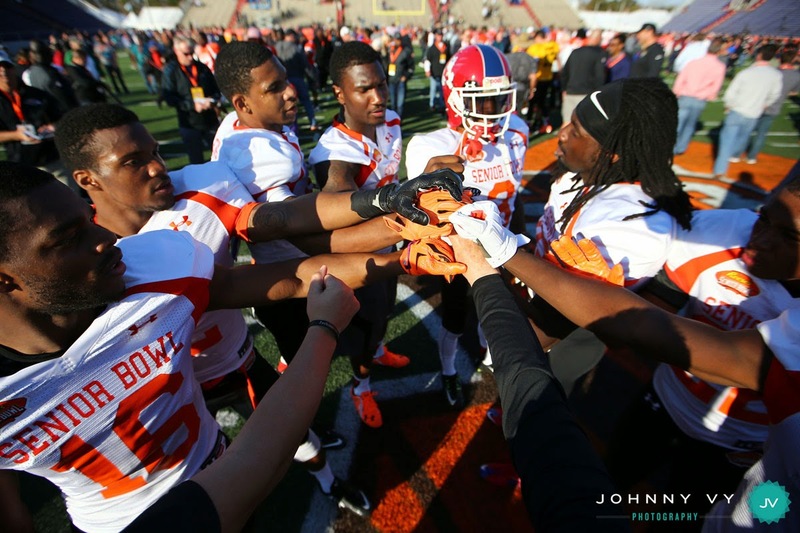 The South team huddles together following practice. 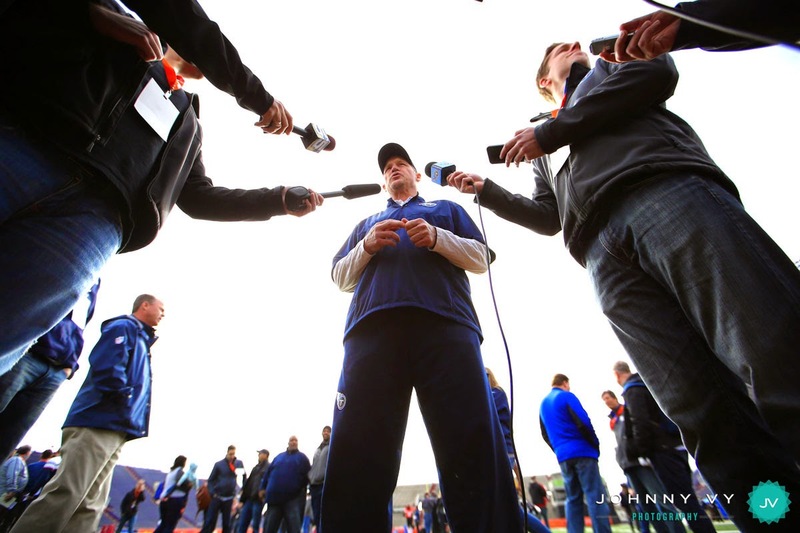 North team head coach Ken Whisenhunt of the Tennessee Titans is interviewed following the North team practice. 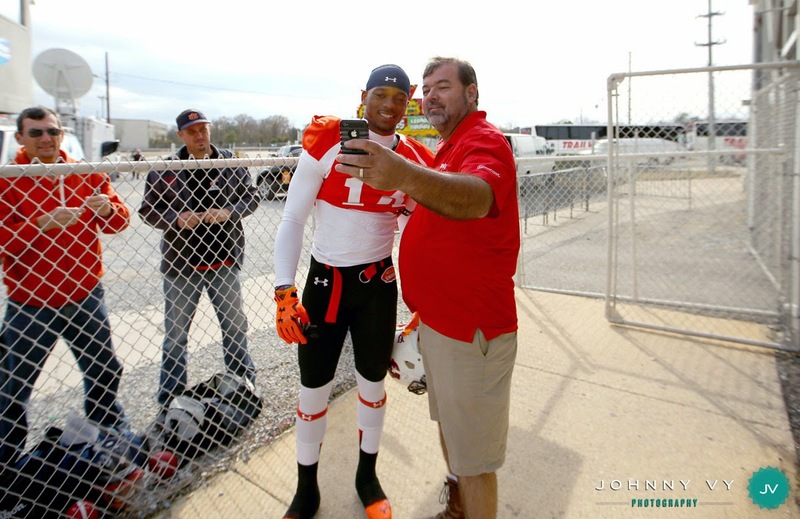 Auburn quarterback Nick Marshall (14) takes a selfie with a fan before the South team practice.